The Nursery is sited in purpose-built accommodation adjacent to the school and Pebsham Primary Academy. 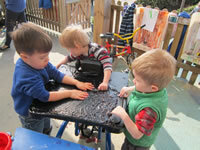 We work in partnership with the Early Years Nursery (managed by Bexhill College). Our aim is to work in an inclusive way while giving our children the extra support and small-steps learning to help them to make progress across all areas of their development. Skilled staff ensure our children build strong relationships to help them to feel happy, secure and confident within a busy Nursery environment. "the key, formative years of childhood are short - the quality of learning experience is therefore of major importance. The skills, concepts and attitudes formed in these early years will be the foundations upon which later learning will build." Our youngest children attend for four sessions a week, usually over two whole days, and this increases to five sessions when the children reach the term in which their third birthday falls. Children are not grouped by ability but by possible and developing friendships and this allows them to meet familiar faces each time they come to Nursery. Working in partnership with parents and carers is essential for all children and we have daily contact through home-school notebooks and have an open-door policy to encourage families to join in with their child's learning. We meet regularly with parents/carers to discuss progress and to plan the next steps for children's learning. Nursery is full of fun and opportunities to learn through exploration and for children to be active and adventurous learners..